Dominguez Hills 1000 E. Victoria. 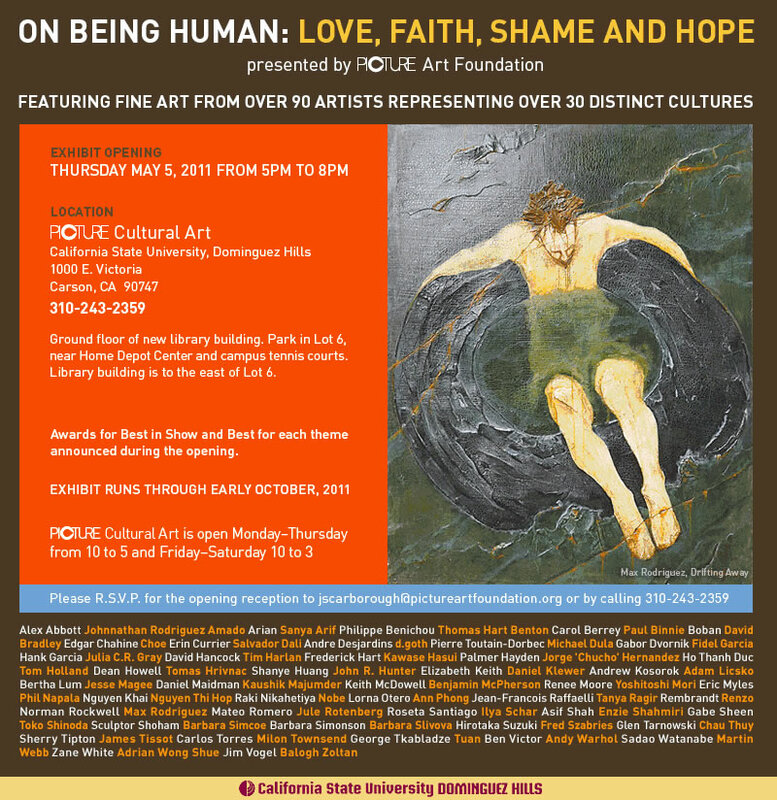 "ON BEING HUMAN: LOVE, FAITH, SHAME, AND HOPE"
PICTURE Cultural Art, the new 4,000 square feet exhibition space on the first floor of the award winning new library expansion at Cal State Dominguez Hills, has announced its second exhibition, "On Being Human: Love, Faith, Shame, and Hope." Drawn from hundreds of submissions from all over the world, this exhibition features pieces in all media by over 90 artists. The roster includes many renowned contemporary artists representing five continents as well as such stalwarts as Warhol, Dali, Rockwell, Tissot, Whistler and Rembrandt. Set to open on Thursday, May 5, with a reception from 5 - 8pm, the exhibition will run until early October. Admission is free. Guests will have a chance to meet many of the artists as well as learn the recipients of the exhibit awards for Best of Show and others. Conceived around four universal themes of love, faith, shame, and hope, the exhibition will show how all humans, irrespective of cultural differences, share a common life experience. Work was selected by the following criteria: representation of exhibition theme; cultural identification; quality of the artwork; and artist reputation and credentials. A full color catalogue featuring each work in the exhibition has been published in support of the show. Says Mike Johnson, PICTURE Cultural Art's President "Our prior exhibition let the viewer study the achievements of early 20th century Vietnamese art within the context of the global development of modern art. This exhibition encourages the viewer to examine art's common themes across several cultures through the centuries. It's our hope that visitors will walk away with a refreshed sense of understanding of the links common to us all. " Representing a private/public partnership with California State University Dominguez Hills, the most ethnically diverse college campus west of the Mississippi River, PICTURE Cultural Art is an exhibition space that hosts world class programs and exhibitions dedicated to furthering the dialogue around cultural awareness and harmony. The hours of operation for the PICTURE Cultural are Monday - Thursday 10am - 5pm and Friday & Saturday 10am-3pm. Private tours are available.